Hi to all, few days ago, I borrowed my cousins electronic drum to begin with electronics learning. I am completely new to electronics, and am trying to learn by building an electronic drum set. I've found lots of examples online of circuits to condition the output from a piezo to be read by a controller (a Netduino in my case). The circuit I'm using looks something like this. 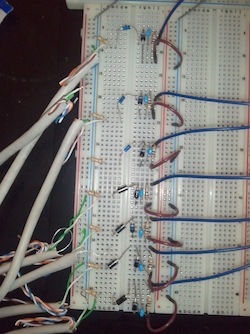 I currently have 6 of these circuits attaching to the 6 analog pins on my Netduino. The circuit is doing a great job of both not missing any hits on the drums as well as giving a pretty good dynamic range of velocity/volume readings. The problem is that when I strike any of the drums very hard, I'm getting some nasty crosstalk (i.e. I hit one drum, but multiple drums are signalled). I've been stuck on this for a few weeks now and have tried tweaking the circuit in every way I can think of, but can't seem to fix the issue. 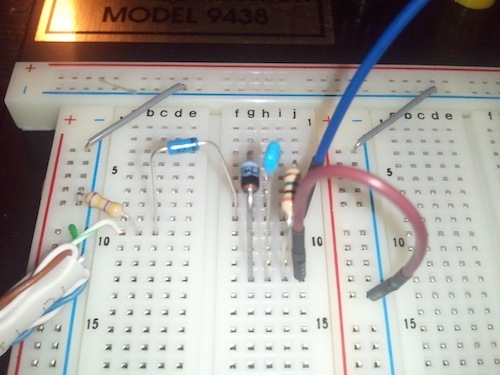 The closest I can come is to put a voltage divider at the end of the circuit. This does remove the crosstalk, but at the cost of significantly less dynamic range (i.e. no matter how hard I hit the drum, I don't get more then around half of the max ADC http://www.kynix.com/Detail/1250161/ADC.html readout value). I've checked and double checked that everything is connected to the same ground. The Schottky should be keeping any negative signal from getting to the Netduino, and the Zener should be making sure I'm not getting anything above the 3.3v that the Netduino wants. Can anyone point me in the right direction for figuring out what's going wrong? Here is my attempt at a schematic. I've just downloaded Eagle and am not entirely sure how to use it, but hopefully this is close enough to give the idea. The piezo symbol on the left doesn't look right to me, but that's what Eagle gave me. Per several requests below, here are some pictures of my circuit (slightly updated from several peoples suggestions). Also, I've included some pictures of the drums. The drums use a special "screen" drum head that makes very little audible sound. 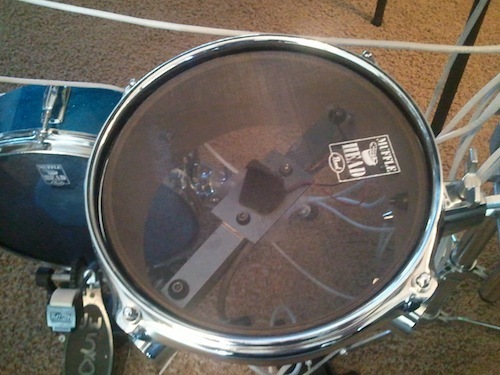 There is a small piece of foam that transfers the drum head vibrations to the piezo. Thank you for your all help.